Lola's story not only shows how she made her big dog dreams come true, but also how helping others makes you feel like a giant. Lola proves that believing in yourself can make all the difference. Marcia Goldman has a master's degree in special education and has worked for 25 years to provide therapeutic-based programs for children with autism and their families. She lives in Atherton, CA. Lola is a Yorkshire Terrier who is proud to be a certified therapy dog. She uses the skills she learned in doggy therapy training at elder centers, preschools, classrooms, and bookstores. "Lola Goes to Work is a lively and adorable introduction to the fascinating world of working dogs. Children will love reading about Lola as she shares what it takes to become a therapy dog, providing comfort to those in need." "My mom said, 'If Lola can do it, you can, too.' Thanks, Lola." This book is sure to appeal to young children. They’ll be able to relate to being told they’re too small and finding things hard to do. They’ll cheer for Lola and wish she’d visit their school and hopefully her story will encourage them to try hard too. There are adorable photographs and a sentence or two on every page. This book is sure to become a favorite of young children. The back of Lola Goes to Work includes a page on therapy dogs as well as a teacher resource page that can be used in the classroom or home. If you have a little one in your life, be sure to check out this wonderful book! Adorable color pictures show Lola attending training and obedience classes and then getting ready to go to work as a therapy dog. She comforts people who are ill or handicapped and she visits children in schools and libraries and helps them learn. She is a joyous, loving dog who imparts a healing sense of life to all she meets. "Lola Goes to Work" is narrated in easy-to-understand, simple sentences that add to the story told by the photos. 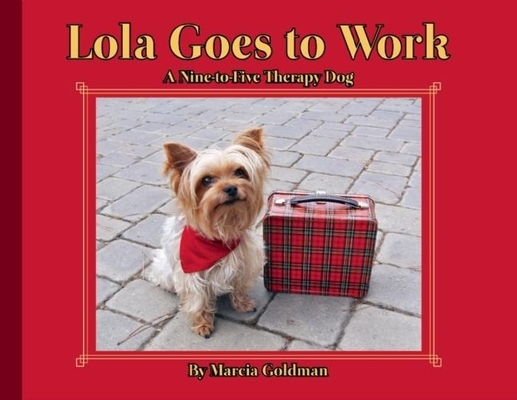 Children age 4 and up will love reading "Lola Goes to Work." Lola Goes to Work is just plain precious. It tells the story of Lola, a terrier who is training to become a therapy dog. After much hard work, she passes the test and is certified to help comfort people in hospitals, nursing homes, and schools. She loves her job and feels important when she helps make others happy! Do I daresay that I'm not a huge dog fan? However, that didn't matter one bit when it came to my enjoyment of this book! I still managed to fall in love with Lola! Lola is just the cutest little dog and the photographs of her are nothing short of delightful. I challenge anyone (child or adult) who picks up this book not to fall head over heels for this sweet little dog. I think LOLA GOES TO WORK is a terrific picture book for young children. Not only will the photos capture their interest, but the book actually has a great message too. I think kids will relate to Lola as the "underdog" -- she is small to be a therapy dog and has to work really hard to pass her test; and I think they will also see how everyone (including animals) has the ability to help others. I especially liked that the last page of the book provided some additional information about therapy dogs. Jason’s dad has a big pool but Gage kept wanting to go in the little pool, aka the hot tub, so I let him sit on the top step when nothing else would do. I brought a few books to Michigan, Lola Goes to Work, is his new favorite, so it was awarded hot tub status. Kathy wrote a great review of this one and then sent it on to Gage. I wasn’t sure he’d like it since he doesn’t have any favorite books with photos, but from our first reading, Lola has been a hit. He likes to finish reading each page for you, but I should mention that Gage’s ’Lola’ sounds suspiciously like Lellow’, but no matter, it only makes her cuter. Lola is a five-pound Yorkshire Terrier who wanted a big job so she worked very hard to become a therapy dog. I wish I had taken a picture of the page I stress to Gage, I learned to sit and stay, to lie down and wait patiently.” Lola eventually passes her test and becomes a therapy for the elderly and classrooms. This is a sweet book that all ages can enjoy. It was written and photographed by Lola’s mom, Marcia Goldman. It’s 32 pages and even has a page at the end for teachers so they can better use the book in the classroom. Not all working dogs are big and powerful, like police or rescue dogs. Some are tiny and gentle, like little Lola, a 5-pound Yorkshire terrier from California certified as a therapy dog. Lola narrates her own story with just one sentence per page, accompanied by a high-quality photograph of the adorable dog at home, in training sessions or on visits to schoolchildren and friends who are not feeling well.” The simple story describes Lola’s challenges in her training to be a therapy dog, which are then echoed in her compassionate assistance to others who are facing different life challenges. The story and appealing photos will draw in preschoolers and children learning to read, including older new readers. Lola is definitely an endearing little character, with charming expressions captured in the illustrations and a tempting cover photo of Lola in her therapy-dog bandanna sitting next to her red plaid lunchbox (almost as big as she is). An author’s note explains a little about therapy-dog training, and a page for teachers offers discussion questions relating to empathy studies,” as well as suggested activities. There are only a couple of children’s books in print about therapy dogs, and this one has the broadest appeal to different age groups. This is an absolutely adorable book. My kids LOVED this one! Lola is a Yorkshire Terrier that trains to be a therapy dog. It’s her big dream and it comes true. The pictures in this book are SO stinkin’ cute. I swear, Lola looks as though she is smiling in every picture. Bravo, Ms. Goldman! This book is a hit at our house. Such a sweet story about a little dog that has a big heart to help others. "LOVE LOVE LOVE Lola goes to work. Perfect for the pre-school classroom. Those 1st and 2nd grade teachers seeking a mentor text for memoir need look no further." Thank you, thank you, thank you Creston Books for letting me and my children read this adorable story!!! I cannot tell you how sweet this book is. My kids read this book several times and it's become one of their bedtime stories to read before they drift off to sleep. Ms. Goldman has a hit on her hands! With such adorable pictures to the sweet story behind them, I don't think any child could pass this one up." "Young children will enjoy the photos of Lola learning how to be a therapy dog and see the joy she brings to those who need a little cheering up. This is a special book to help young readers learn about community helpers, and how their dogs can have a job and responsibility besides playing with their owners. "As I have been reading through the years' picture books, Lola has stayed with me not only for the "cute overload" photography but for its pitch-perfect language perfectly suited for early childhood classroom. Thank you. This book is a real gift with a unique voice." Lola is a lovable Yorkshire Terrier who is certified as a therapy dog for visits to classrooms, hospitals, and centers for elderly people. Through endearing close-up photographs of the pup during training and on the job, readers learn about her daily duties, as told from her point of view. "Young children will identify with this small, spunky, and determined pup."